Q&A © 2018 Crown Media United States, LLC | Photo: Kim Nunneley / Alexx Henry Studios, LLC. Daytime TV has a new super couple! 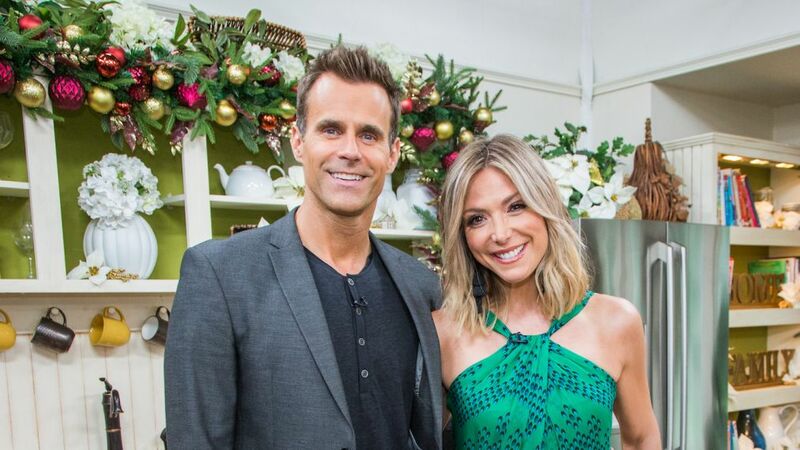 As previously reported, Cameron Mathison is joining Debbie Matenopoulos as the new co-host for the Hallmark Channel’s Home & Family. Watch for the Emmy-nominated actor to guest host the program again on Friday, August 10 and then step into his official full-time hosting duties when the daily talk show returns for Season 7 on Tuesday, September 4 at 10 a.m. PT/ET. Read on as the former All My Children star explains how the deal fell into place, whether or not we’ve seen the last of him on Entertainment Tonight, and if he’ll ever do another daytime soap! Cameron Mathison: I’d filled in here and there on Home & Family before and was one of the candidates they had in mind to fill the male co-host seat. My contract was coming up at ET and the timing just all worked out. The energy and the fit made sense. I’d worked with Debbie on and off for years. We used to co-host a show on the Style Network [called Instant Beauty Pageant]. We were friends back when she was on The View and I was on AMC [as Ryan Lavery]. We’ve known each other for over 20 years! So what’s your status with Entertainment Tonight? I’ve left ET as a full time correspondent, but I’ll be filling in with the weekend show and doing special assignments. How do you juggle all this with the Hallmark movies you do and other projects? It really does take a lot of foresight and planning. I try to plan things out and make sure I’m not overdoing it and I make sure it makes sense for the family. We made sure we worked with ET on this. It was a joint decision and they’re all super-psyched for me. As far as the movies I do for Hallmark that’s all going to have to be worked out. I’m doing another movie for them this month and after I finish that, I start Home & Family [full time]. It’s all falling into place. The timing has been out of this world! I got lucky. A lot of this business is timing. Home & Family airs two hours daily! How do you keep the energy going for that length of time? That’s one of the challenges of this show. I make sure I stay focused. There are a lot of two-hour live shows out there, like Good Morning America, which I’ve done, but it’s rare that the hosts are in every segment all the way through, driving every segment. I really prepare, prepare, prepare and I just look at the next task. I focus on what’s in front of me and then I move on to the next thing. If you look at the big picture too much it can be very overwhelming. Have you gotten response from industry colleagues and friends? You and former AMC co-star Kelly Ripa (ex-Hayley; Live With Kelly and Ryan) sort of have the same job now! Yes. I’ve gotten tons of emails and texts. It’s been very sweet. I haven’t heard from Kelly yet [about this], but she did reach out to me about the Instagram picture I recently posted of my son Lucas and me. Where are you with acting? The rights to the AMC characters are back with ABC now. I’m coming up on my 14th movie for Hallmark and they’ve been so good to me. I love the characters I play and the network. I’m definitely still concentrating on the acting side [of my career] and where it fits in with Hallmark. As far as going back to daytime, I’m always open to that, but I don’t know how I’d do it scheduling-wise. The fun thing about hosting Home & Family is that you get to learn something new every day. Yes! I can actually go home and impress my wife with some new recipe or DIY project I’ve learned!